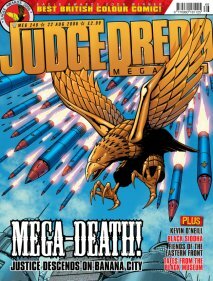 Tharg gave me quite a detailed brief on this one asking for tons of missiles coming from top right to bottom left of the cover and in amongst them an attacking eagle of justice. 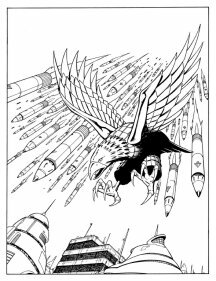 I gave the pic a high perspective point so the missiles would seem like they were coming right at you and also added a bit of city detail at the bottom to ground the picture. 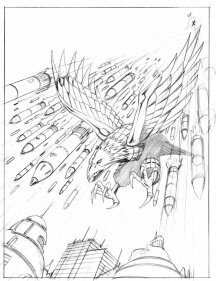 I looked up some ref of attacking eagles too to help with the drawing and then adapted them to a Dredd eagle. I blew up the rough to A3 tightened it up and inked it. I kept the linedrawing simple again like I did with the Maelstrom cover. I also tried to keep the missile design quite simple as I was going to have to draw so many of them. I coloured it in photoshop. 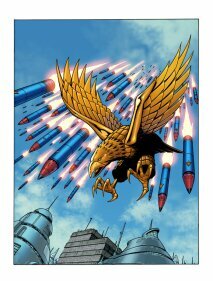 I tried to make the eagle look nice and shiny and gave the missiles a sort of Judge colour scheme using blue red and gold. I then did some colourholds and glow effects on the missile exhausts.